POOR Lucy the parrot has a mental health problem. She’s constantly biting her feet and legs — and her owner’s about to fall off her perch with worry. Vet Phil Sacks is trying some anti-inflammatories to calm the irritation and has fitted a collar to keep Lucy’s beak away from her legs. If that doesn’t sort things, she’ll need anti-anxiety medication (Lucy, not her owner). “It’s an obsessive compulsive disorder and it’s literally killing her,” Dr Sacks says. In another consulting room at Burwood’s Bird Vet clinic, a chook owner is making the painful decision to euthanise her beloved pet. The chicken has too many eggs inside her and the prognosis is not good. Nearby, baby cockatoo Gang Gang is recovering from surgery. A wildlife carer tried to feed him with one of the teats used to feed kangaroos — and Gang Gang decided to swallow it. “Best to use bird syringes or spoons for hand feeding,” Dr Sacks points out. Dr Sacks is a long way from South Africa, where he began his veterinary career. There, working with the Johannesburg Zoo, he performed root canals on tigers and delivered infant marmosets by caesarean. 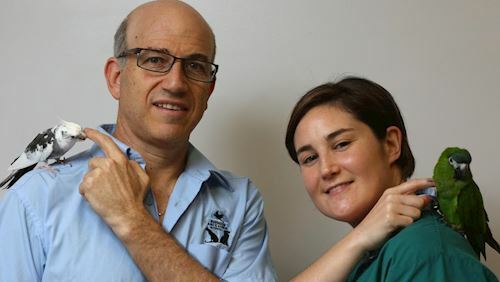 Now, Dr Sacks is one of only a few vets in Victoria specialising in avian medicine. He treats birds as small as finches and as large as turkeys. Dr Sacks recommends people buy purebred chickens rather than commercial varieties, as the commercial chooks are usually bred for maximum egg production rather than a healthy long life. The vets and nurses at Burwood are dedicated to their feathered patients. Birds end up in the clinic’s waiting room for all sorts of reasons — from poor (and usually illegal) wing-clipping and poor diets to overgrown beaks and balance problems. The “treats” that line supermarket and pet shop shelves are also the cause of many presentations. The birds chew enthusiastically at seed ropes and fabric huts, leading to buildups of fibre in their crops, which is often fatal. Birds are considered a “low-value” pet, Dr Sacks explains, and owners — often pensioners and those without much money — can be reluctant to seek vet help, fearing the cost of treatment. However, the clinic can assist poorer owners through the Pet Medical Crisis Fund, which is run by unpaid volunteers.